In this first part of his series on ITaaS Transformation, Cloud and ITaaS Strategist Philippe Abdoulaye highlights business line expectations, disconnects between the business and IT, and a delivery model intended to help CIOs meet their business line requirements. What you must be aware of is, ITaaS isn't a technology, it's simply an operational model. That is, it's an integrated platform of people, processes, best practices, governance structure, and technology specifically arranged to meet specific business goals. In order to give BLs the competitive advantages they need to grow in the digital era, you must drop the belief that cutting IT costs and accelerating application delivery is what matters. You must reinvent the relationship with the business and offer a new IT service delivery paradigm more focused on business concerns. A topic that's unfortunately out of the purview of IT is the transformation of the competitive environment and how businesses adjust to it; it's a major issue for BLs and one that CIOs should not underestimate. As Figure 1 shows, a number of forces are conspiring to step up global competition and change the way businesses deal with it. They include the proliferation of startups created by highly qualified unemployed seniors and entrepreneurs, and the increasing adoption of cloud technology, which reduces IT Total Cost of Ownership (TCO). 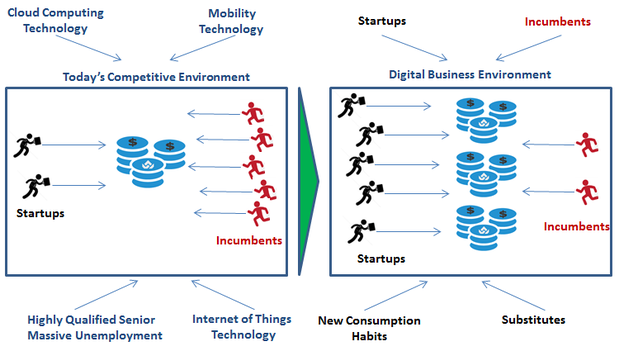 Also, the Internet of Things (IoT) substitutes traditional services with digital services. Responsiveness to market opportunities is now the required competitive advantage. There's a serious disconnect between business lines and IT about how ITaaS could help to meet the digital challenges. IT insists on seeing expense reduction and accelerated application delivery as the way to go. BLs see the establishment of integrated collaborative environments involving the business and IT as the most effective way to break down organizational siloes and hierarchical barriers and meet the market responsiveness challenge. An IDG Research Services Survey, "Your Journey To IT as a Service," involving 350+ IT and business unit directors at enterprises with at least 1,000 employees, confirms as much. It finds that only "11% of business folks believe IT understands the business needs and wants" and that "more effective IT and business partnerships" is the way to go. One of the reasons business lines increasingly use shadow IT is CIOs and IT vendors ignore their concerns. While business lines think an agile and integrated environment of people, processes, best practices, IT services and tools could help to responsively address market opportutinies, IT continues to offer the same cost reduction and accelerated application delivery value propositions. Let me say things straight: ITaaS as understood by cloud vendors is incomplete. 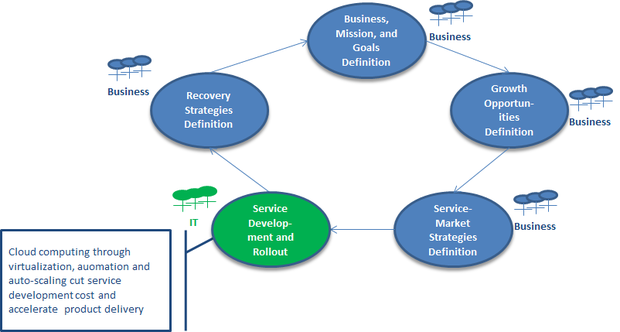 As Figure 2 shows, business prosperity is part of a wider cycle and cloud solutions impact only the Service Development and Rollout step - but not the other four. Today's ITaaS approaches rely on assumptions which are erroneous from the business perspective. Business folks don't hesitate to claim this, "the benefits generated by your IT transformations represent less than 3% of what we gain from increasing our customers' value through basic up-selling and cross-selling techniques." Thinking that implementing sophisticated cloud infrastructures by itself will enable business growth is a mistake you must avoid; the truth is 99% of ITaaS (and cloud-related) projects are successful from a technology standpoint but are unfortunately disasters in terms of meeting BL expectations. Joe McKendrick, one of the most relevant analysts in the cloud industry, in an article "Cloud Computing's Second Act Is All Business," warns, "IT is one small piece of the cloud story. A much bigger story is coming from the business itself. This is also the hard part." In fact the business expectations are taking IT to an inflection point. IT cannot be anymore thought of in terms of technology stack. Rather its three dimensions including the Operating Model, the Cloud Services, and the Infrastructure must be taken into account. Largely ignored by today's IT practitioners, they're actually the enablers of the operational agility that underlies the lean, agile IT organization BLs have been calling for. Taking into account the IT organization's three dimensions will take your IT to what Joe McKendrick refers to as "Cloud Computing's Second Act." It doesn't narrow the ITaaS transformation process to changing the technology stack but extends it to the re-engineering of its operating model and service catalog (see figure 3). As figure 3 shows, the bottom line of ITaaS transformation is to shift your IT organization from a siloed, traditional enterprise IT delivery model to a lean and agile ITaaS model. The key takeaway is, from the business perspective, reducing IT costs and accelerating applications delivery are insufficient steps. They must be supplemented with organizational capabilities that span the organization's entire growth life cycle and ensure the operational agility needed to responsively address market opportunities.